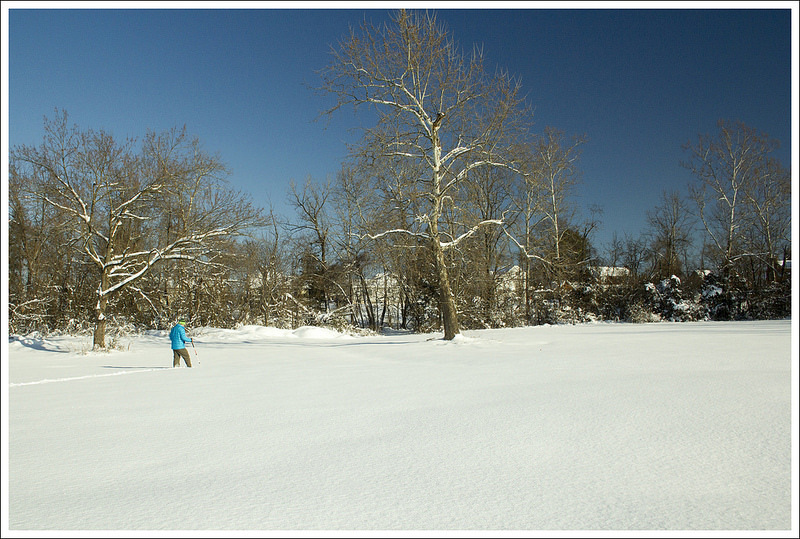 We walked a beautiful two-mile snowshoe loop on this lovely network of trails in Elkton, Va.
Adam walks along the Elk Run Trail. We finally got a significant snowfall! The first day of the storm, we were snowbound at home. We spent the day digging out and hanging out. But early the next morning, after the snowfall stopped, we headed over to the Elk Run Trails. 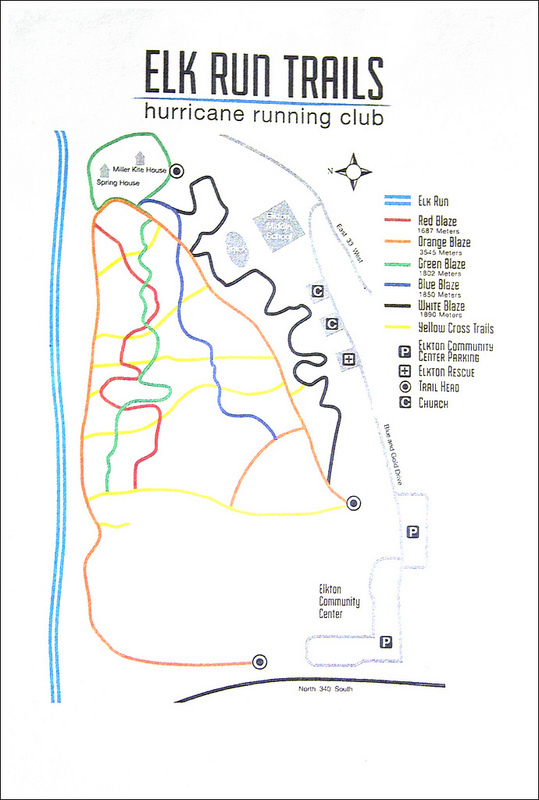 The trails, maintained by the Hurricane Running Club, are primarily intended for cross country running and walking. 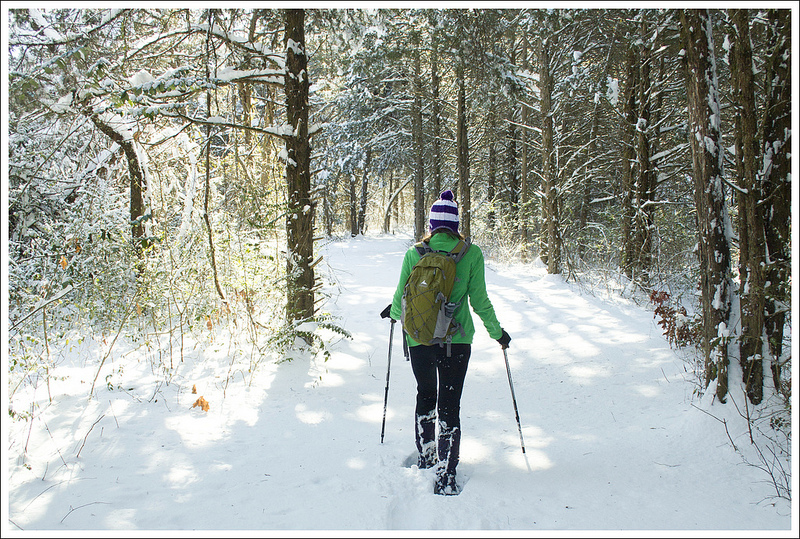 However, under a heavy bed of snow, they’re simply perfect for snowshoeing. We parked our car at the Elkton Community Center and set out from the trailhead on the west side of the center. For much of the first mile, the trail follows parallel to Elk Run Stream. 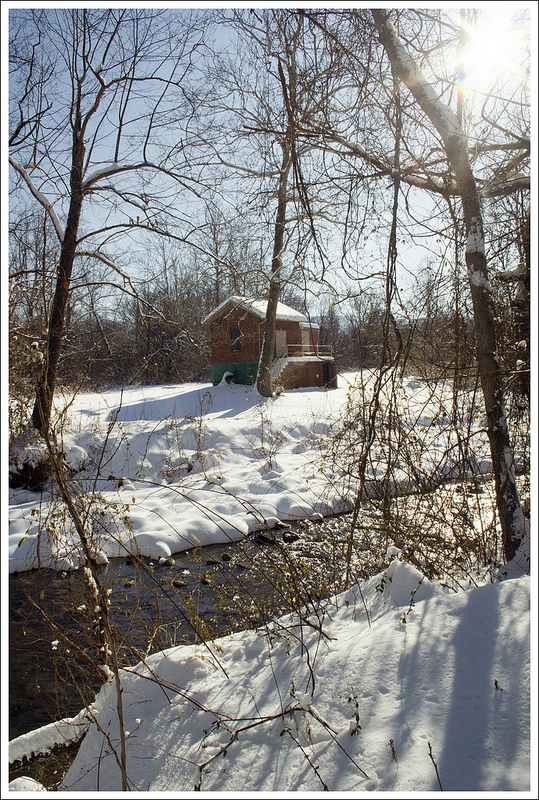 While you can see houses on the far bed of the stream, the trail still offers a lovely wooded setting. On this particular day; the deep, soft snow made for slow, arduous progress. The only climbing on the walk comes as you approach the back side of the Kite Mansion. One short climb takes you past an old spring house. Then a shorter, but steeper, ascent brings you up to the east side of the house. 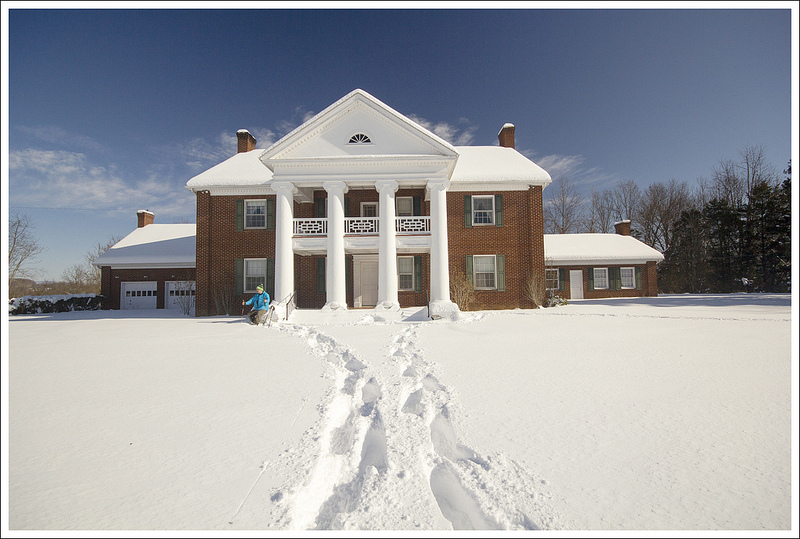 We walked across the columned front of the house and picked the trail back up on the other side. Adam makes his way across the meadow behind the community center. A brief descent brings you back to a dirt road that parallels Route 33. The trail is completely flat and passes through a tunnel of hemlocks and pines. Eventually you come out on the road, just east of the community center. From there, we popped off our snowshoes and walked the brief 10th of a mile back to our car. It was a wonderful morning in the snow! 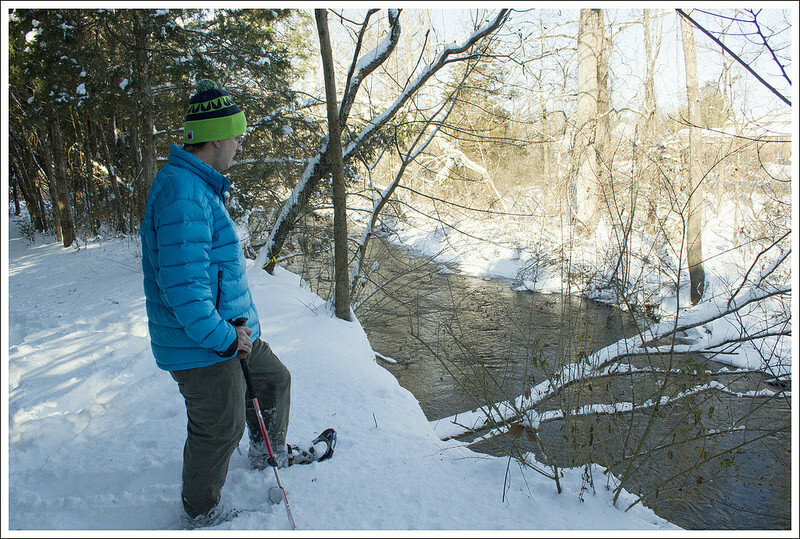 When the weather wants to dump a lot of snow on the ground and you feel like you couldn’t hike anytime soon, grab some snowshoes and hit the trail. 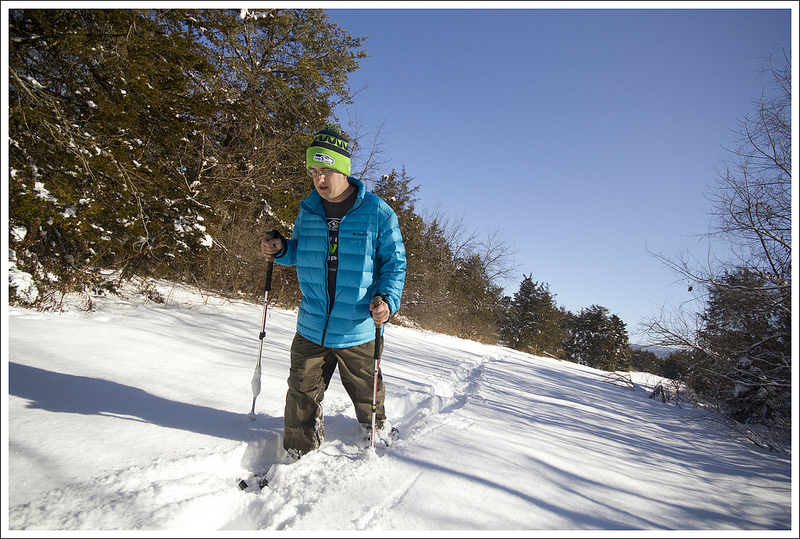 We have been on this Elk Run trail system before in dry conditions, but this trail seems made for snowshoeing. The only map you can find of this trail system is on the photo link above. You can pick up a copy yourself at the Elkton Community Center during normal business hours. Our trip consisted of doing the entire orange trail starting from the west end, but included the green loop trail that takes you up to the Kite house. We parked at the Elkton Community Center and went behind the building. We spotted the orange blaze across the field behind the building that denoted the start of the trail system. The trail was untouched (minus a few squirrel tracks) when we hit the trail and we quickly realized how tough snowshoeing over a foot of fresh snow could truly be. After a short time, we decided to shed some layers since we were working up a sweat from the effort. The trail started off with a long scenic walk alongside the Elk Run. At about .9 miles, the trail begins to start up an ascent and you can then join the green-blazed trail. Take this up a steep but short hill and at the top of the hill take a right. This will lead you to the front of the Kite House. Continue to cross in front of the Kite House and you will see the trail pick up again, going steeply downhill. At the bottom, you come to a larger trail junction. We took the orange-blazed trail again, which takes you through a wooded section behind Elkton Middle School. After about .5 miles, the trail widens and then eventually leads to a road. Take a right here and follow this back to Elkton Community Center, where you parked. Elevation Change – 100 ft. Difficulty – 1. The trail is almost completely flat. However, in deep, unbroken snow, you should expect more of a challenge. Trail Conditions – 4.5. Wide, flat and well groomed – may be muddy. Views – 0. You’re in the woods the whole time. Streams/Waterfalls – 2. 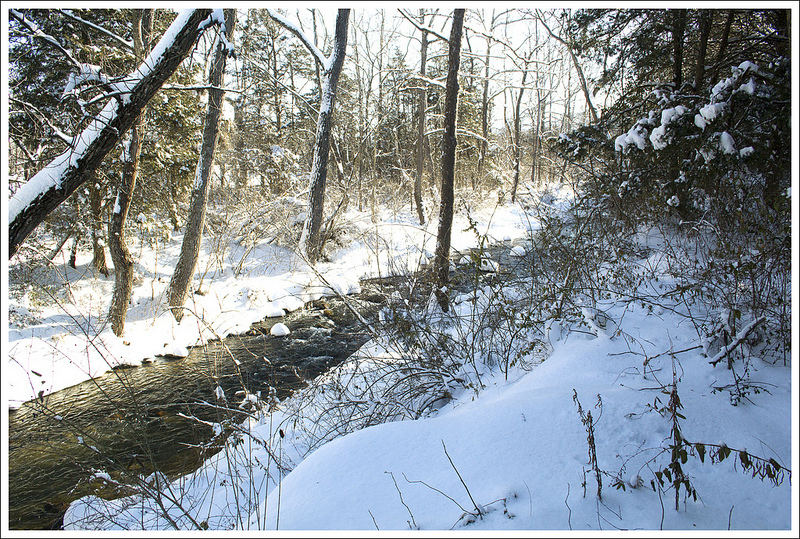 Elk Run is pretty, but is often obscured by brush. Wildlife – 1. You’ll likely see a variety of birds and possibly deer. We saw a beautiful red fox when we walked the trail on Thanksgiving day. Ease to Navigate – 3.5. There are tons of inter-connected trails. They’re blazed but unnamed. Everything loops back, so it would be hard to get lost. Solitude – 4. Typically, you’ll only see a few people on this trail. Directions to trailhead: From I-81, take exit 247 towards US-33E heading towards Elkton, VA. Follow this 15.6 miles before taking the ramp to the right to US-340N. Take the first right and you will see the Dairy Queen to the right. Directly across the road from Dairy Queen is the Elkton Community Center. Park your car here. Behind the building, you will see the orange blaze which signifies the start of the orange-blazed trail.